Just when I was learning to read I found a book in our attic which promised to teach me the language of birds. It was torn in half though, and the half with the answers was missing. 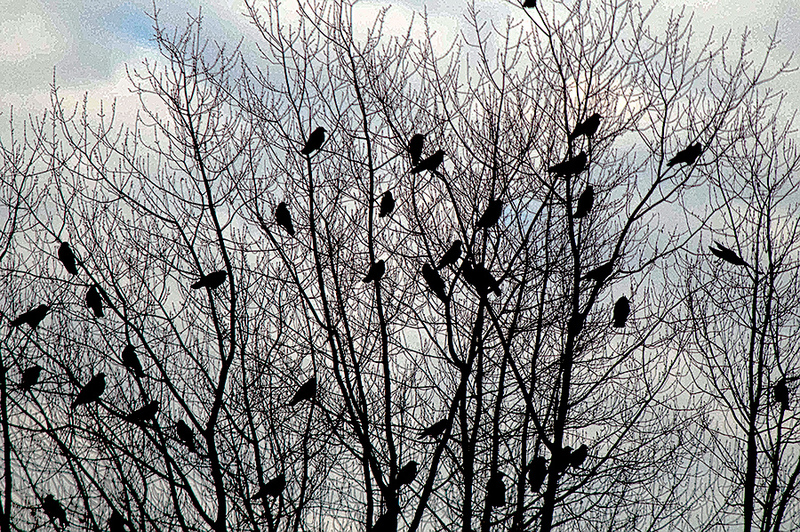 So to my great disappointment the language of birds remained a mystery. That same desire underlies much of today's research about birds. Will we ever know how birds are seeing their world, how they interpret what goes on around them, or what they are thinking? Are they even conscious? The sixteenth century French philosopher Descartes claimed that animals are automatons, that is, pure machines without consciousness. Many researchers still adhere to the view that animals are biological entities subject to inborn unalterable instincts, but as animal owners and caretakers have known all along this is not true for their pets, not true for farm animals, nor is it true for laboratory animals. On closer acquaintance we know that within the limits of their abilities they are all individuals, have different personalities, are bold, shy, curious, anxious, happy, moody, playful, sociable, gregarious or withdrawn... just like human beings. 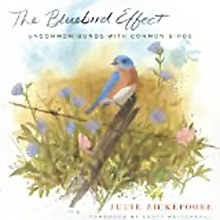 If looking at the cover painting of Julie Zickefoose's The Bluebird Effect you think it's a picture book, you are mistaken. 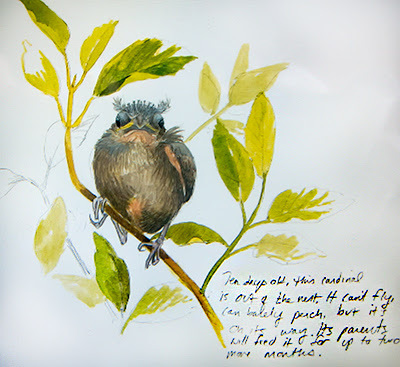 Yes, the author is an accomplished artist; she illustrates her book with exquisite paintings and drawings, but her look at birds goes much deeper. In her work and writing she combines a human's lively empathy and warmth, a scientist's cool eye and a child's curiosity and wonder. She takes on the arduous work of a bird rehabilitator in rearing abandoned nestlings or injured birds. 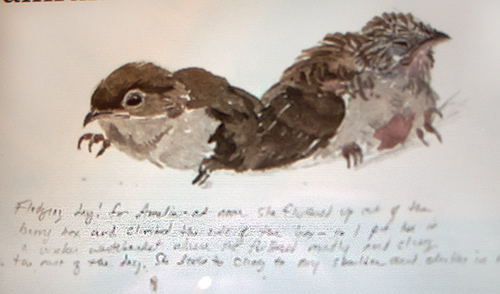 She takes on the impossible task, for example, of raising the chicks of chimney swifts, blind and naked, only a few days old, dislodged perhaps by a chimney sweep. 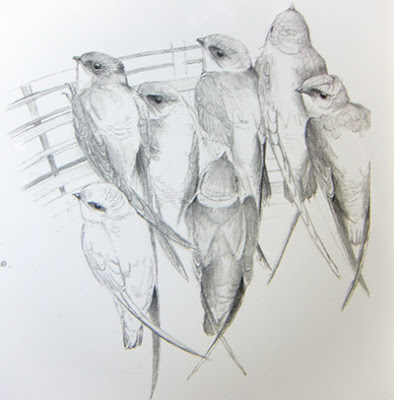 She gives them a home in a rattan basket where they can cling to the wall, the closest approximation to the inside of a chimney, keeping the area well heated to 8o degrees, blows on them to imitate the wing beat of the arriving parent, nudging them to gape to be fed every 20 min, and keeping them hydrated with an electrolyte solution by eye dropper. She gives them names but they are not pets; she releases them back into the wild as soon as they indicate they are ready. The greatest reward for her is when one of her former charges recognizes her and, peeling away from its wild companions, lands on her shoulder. She is a terrific writer. This book would enchant and entertain any bird lover. It would be a great gift for budding birdwatchers and perhaps foster in them a passion for birding. 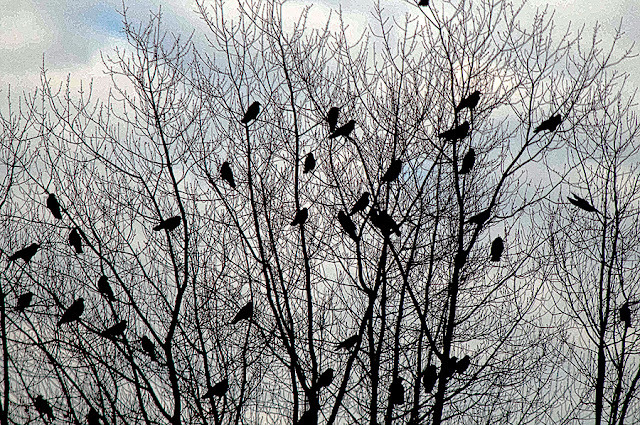 Corvids, of which crows are a member, are exceptionally smart. According to the author they have much in common with us: language, delinquency, insight, frolic, passion encompassing wrath and grief, risk-taking and awareness. He devotes a chapter to illustrate each property with fascinating observations and stories. For example when caching food, crows are very aware of which particular bird is watching them. They may only pretend to cache and, when no one is looking, move the cache to another place, but they only do so if they themselves have been thieves. Another example: observing a small flock of geese being tossed pieces of bread, crows quickly covered up each piece with a maple leaf, making it invisible to the geese, and saving it for themselves. This particular ability to know what another individual, even another species, is thinking is shared only by our closest primate relatives. It's a complex cognitive property called possessing a theory of mind. They share with humans the ability to lie and deceive, to misdirect and prevaricate. They are the opposite of simple-minded. 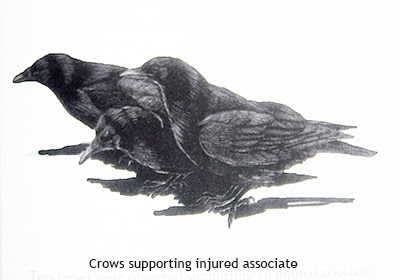 Crows may come to the rescue of an injured flock member, or alternatively they may show aggression and rage, ending up killing disabled bird with their beaks. 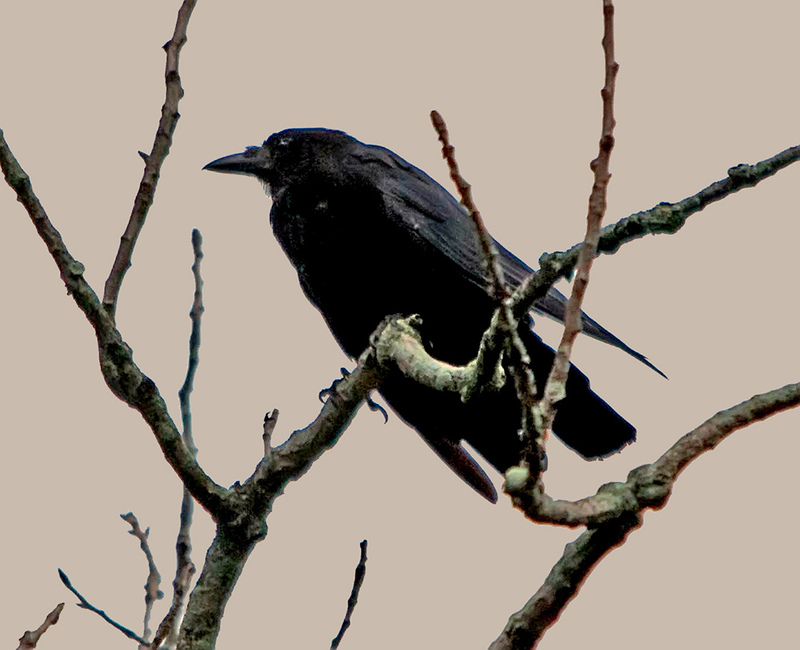 The author has various theories about what in the crow's brain could trigger such behavior, which chemicals or what neural events may be playing a role. Regrettably much of the book is taken up by these detailed discussions of the underlying mechanisms and pathways. 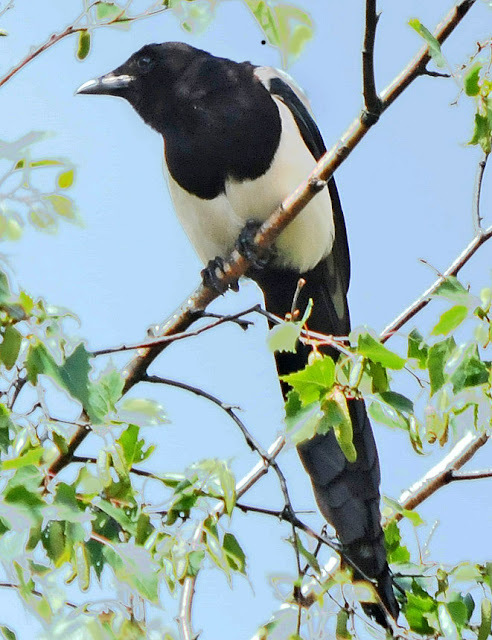 Corvids appear to think a lot like us, but have arrived at this ability over different pathways, that is, by convergent evolution. I found such discussions interesting only to the extent that I learned that bird brains have a very different architecture from mammalian brains. Perhaps the authors felt the need to buttress their anecdotal observations with a scientific foundation. Most readers will probably find this arrangement distracting. I skipped a lot of it. 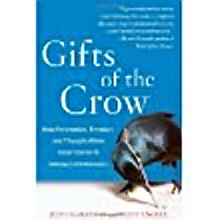 But still, it was fascinating to read about their complex behaviors demonstrating calculation, aforethought, planning for the future, playing tricks, and even showing gratitude in giving token gifts to humans who have treated them kindly. 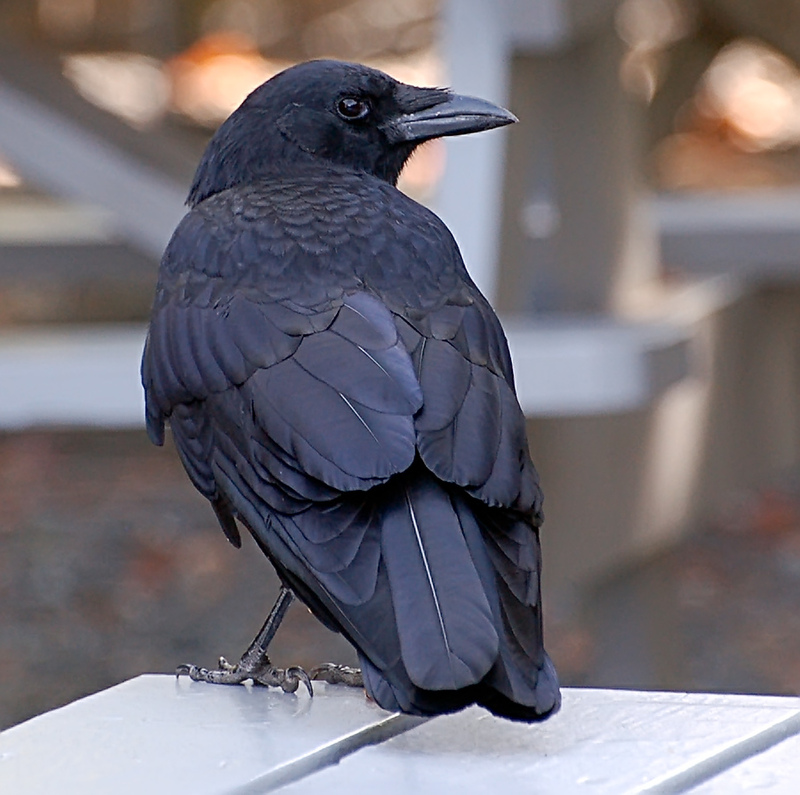 So, when glancing at a crow it's tantalizing to think that there's an intelligent being looking back at you. We always wonder how animals can be so much like us. Maybe we should turn it around and wonder how much we are like animals, or how little separates us from animals. We are smart, we can figure things out but, like our avian relatives, it's our emotions, much more so than intellect and reason, that make us who we are. "The difference in mind between man and the higher animals, great as it is, is certainly one of degree and not of kind. We have seen that the senses and intuitions, the various emotions and faculties, such as love, memory, attention, curiosity, imitation, reason, etc., of which man boasts, may be found in an incipient, or even sometimes in a well-developed condition, in the lower animals." There's an interesting PBS Nature Video "A Murder of Crows" (about 40 min) on the author's research on crow's facial recognition, and how they pass on any bad experiences to flock members and offspring. 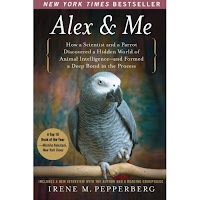 The deeper we dive into animal intelligence, the more complex it becomes. We have finally gotten beyond looking at animals as mere biological mechanisms. 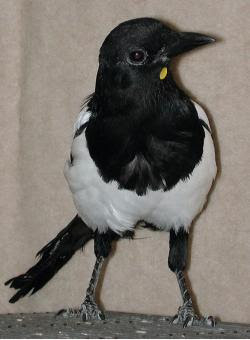 We test them and are astonished to find that they can count, determine the difference between classes of objects, are able to predict another bird's mind, detect faking and misdirection. These abilities are as useful in their world as in ours; so it's not that surprising that they resemble us in many ways. 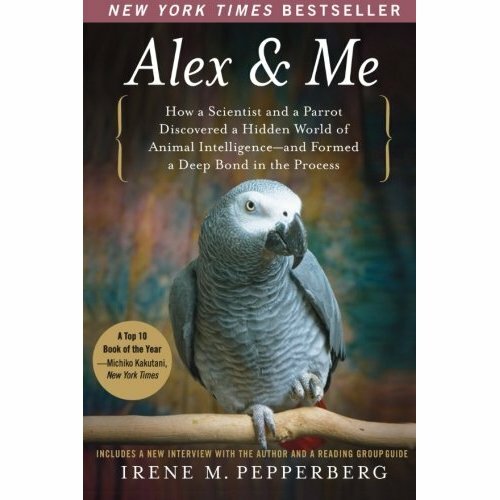 In this book the author recounts Alex's life from a personal perspective as she struggles to find appropriate lab space and grant money. She also struggles to have her research recognized. That in part determines her relationship to the bird: an emotional attachment to the subject of her study would rob it of its credibility. She usually had a number of assistants working with Alex. He learned quickly how to manipulate them for extra treats. In fact he played the boss in the lab, often strutting around like a little Napoleon, giving orders to all and sundry. He liked to play tricks such as shouting out wrong answers to a younger parrot who was being trained nearby, or wolf-whistle at male students walking through the lobby. He grew close to one assistant in particular, calling him by his name and running up his arm to perform the Grey's mating dance. But when the assistant had to be away for three months, Alex felt abandoned and never forgave him. Upon his return he never spoke to him again. 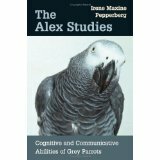 Fleshed out by countless observations and anecdotes Alex becomes a fully rounded character. His achievements and personal quirks are celebrated in newspaper stories and at fundraising events. He gains such world-wide renown that when he dies letters of condolences from fans around the world flood into the lab. Along with such luminaries as Ingmar Bergman, Luciano Pavarotti, and Lady Bird Johnson, he even merits an obituary in the Economist. a totally wonderful and well prepared post. Thank you for it; I especially enjoyed reading about Julie, the multi-talented author/artist. Wow Hilke was a fantastic post! TErrific writing and story-telling here. Well done! Great post, these are wonderful books. I am looking forward to seeing the follow-up, Julie. Very interesting post, observing animals and the way they behave is fascinating. I always think that it is all dependent on how humans decide to measure intelligence and that they are always biased towards humans being at the top of the list. A lot of what humans do seems pretty un-intelligent to me! Wonderful, informative post Hilke! Learning about bird behaviors is truly intriguing. I think that parrots and crows should be given a chance at government! But they are probably too smart to accept the offer! I am fascinated by what I've read and learned from your post, Hilke. Thanks for preparing and sharing! Thank you all for your kind comments! These books are all great reads. Superb post filled with interesting information! I am always fascinated by bird behavior and it sounds like the books you featured have a lot to offer. I was particularly taken with your mention of Julie's book. This sounds like something I would truly enjoy perusing. I appreciate all the time you put into creating and sharing this exceptional post, Hilke!